How do you know you really exist? It's Maisie's birthday and she can't wait to open her presents. She's hoping for the things she needs to build her own nuclear reactor. But she wakes to an empty house and outside the front door is nothing but a terrifying, all-consuming blackness. Trapped in an ever-shifting reality, Maisie knows that she will have to use the laws of the universe and the love of her family to survive. And even that might not be enough. His novel The Many Worlds of Albie Bright won several children's book awards including the Brilliant Book Award and was also nominated for the CILIP Carnegie Medal, as was his novel The Jamie Drake Equation, which was also selected by The Times as one of the best children's books of 2017. 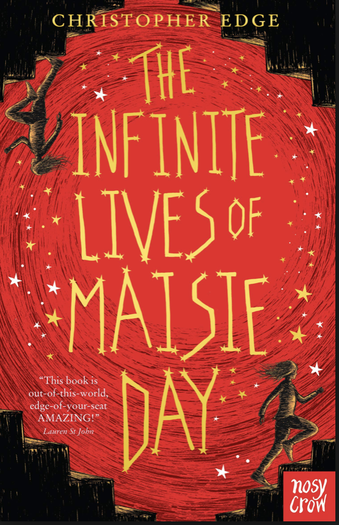 His latest novel The Infinite Lives of Maisie Day was chosen by The Times as their Children's Book of the Week and has been described as 'out-of-this-world, edge-of-your-seat AMAZING!' by Lauren St John.